Steven Universe has always been invested in queer representation. 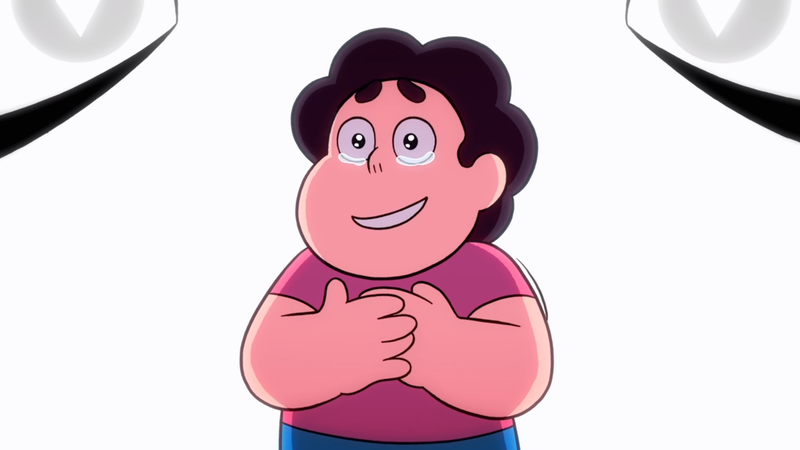 Rebecca Sugar and her team have worked to present the lives and loves of LGBTQ+ people in ways comprehensible to kids and palatable to censors, building a story about found family and the freedom to love who you want out of a space opera about sentient gemstones and a gregarious magical child. But in the latest arc, the show has told a more specific story, one that speaks to me very personally. It’s not just a metaphorically queer story. Instead, it re-positions all of Steven Universe as a metaphorically trans one. Steven Universe has always been preoccupied with identity. Who is Steven, and what relationship does he really have to his mother, Rose Quartz, who gave her existence (and her gem) to allow him to be born? How does he live up to his mother’s legacy, and what does that even mean? The recent revelation that Rose is actually Pink Diamond, heir to an interstellar empire, makes those questions even more intense, and much of the show’s runtime has been spent with Steven learning to come to terms with who his mother was and wasn’t. The latest arc, taking place on Homeworld, changes the terms of that conversation. When Steven enters the world of the Diamonds, he’s not seen as Pink Diamond’s descendant. Blue, Yellow, and White Diamond don’t even know what a descendant is. Gem society has no children, no parenting, not even any boys. Instead, by their understanding, Steven literally is Pink Diamond, either faking it in a strange disguise or suffering from some sort of amnesia. According to them, the human boy Steven Universe doesn’t exist. He’s just a persona. A mask. For transgender viewers, that framing of the relationship between Steven and Pink might strike a nerve. It certainly did with me. For a lot of us, being trans looks like a complete change in persona—a new name, a new appearance, even a new personality. A gender transition (for those of us who do transition) can, over time, render you unrecognizable, an entirely different person in the same spot where the old one stood. And even those of us who don’t transition can take on significant changes—a new name, new pronouns. One of the quintessential struggles of trans-ness, then, is getting other people, especially people from our past, to understand and accept these new changes. And, in some cases, to even believe they’re legitimate—that you are, in fact, who and what you say you are. The trans subtext comes to a head in “Change Your Mind,” a special that’s as much about the Diamonds learning to accept Steven as himself as it is about the Diamonds learning how to heal their broken family. As Blue, Yellow, and eventually even White come around to Steven’s side, they also come around to respecting his identity—in one fantastic moment, Blue tells Yellow, “I believe she prefers to be called Steven.” (Okay, she got his pronouns wrong, but we can maybe overlook that due to Homeworld literally not having any men. She’ll get there.) Both Blue and Yellow begin addressing Steven as himself, and when Steven confronts White Diamond, this is the issue raised to the surface. They’re gone. In that one scene, Sugar and co. manage to illustrate the struggle of a trans person trying to demonstrate to their family that, yes, I am who I say I am. I really am a girl. Or a boy. Or non-binary. In reality, we can’t tear our insides out and present them to the people questioning us. But I know I’ve certainly wished I could, just to end the doubt. And there are some people who, like White Diamond, are unlikely to listen to anything less. When I was a kid, there weren’t any shows on television with such vivid, and moving, trans subtext. I’m glad kids growing up today have this one.